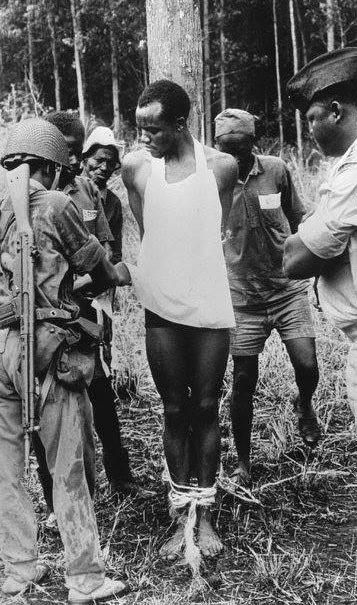 On this date in 1973, 12 actual or supposed Ugandan guerrillas opposing the Idi Amin dictatorship were shot in groups of one or two at various places around the country — having been condemned just days before in military trials for terrorism and assassination plots. “The execution by firing squad that has been carried out today is a real lesson to the people of Uganda to know that involvement in guerrilla activities means loss of life,” a military spokesman explained, unnecessarily. (Times, Feb. 12) Just to make sure the public turned up thoroughly for the lesson, the shootings were filmed and televised. The book Battles of the Ugandan Resistance contains an account of Namirundu’s capture. According to the author, Namirundu was a mere bystander whe Ugandan troops arrived to his area trying to arrest rebel leader (and present-day Uganda president) Yoweri Museveni. Museveni gave them the slip, but as soldiers rudely searched houses, the teenaged Namirundu made a panicked run to get away from them, which act was taken as self-incrimination and led him to the stake.